I first came across Strikingly in 2016 while reviewing a series of website builders for people who want to create their own website. It didn’t stand out to me at that point, but there has been some new changes so I thought it deserves a mention. In this Strikingly website review, we’ll look into some of its features and see how it stacks up with the current website standards. For those who don’t know, Strikingly is a website builder that uses intuitive commands to build and edit the components of a website. It’s somewhat similar to the popular Wix software, just slightly different in orientation. Catered for business owners as well as personal users, the technology gives users a clear visual idea of how their sites would look like as they move along the process. There are basically two types of hosting plan – Limited and Pro – and each has its monthly, yearly and 2 year pricing. Each paid plans come with a 14 day free trial and there’s also a free forever account that allows you to build a (limiting) website using a subdomain. Here’s a video that explains more about the plan or you could visit their page here for more information. The whole setup process is pretty straightforward. Just select a plan and you can start editing immediately. 1) In terms of templates, there are many options to change the color schemes, font styles and component layouts. This highly customizable feature allows you to pick and choose the right designs to suit the purpose of your website. 2) In terms of site recognition, you can easily upload a logo and set the site title and description from the get-go so that the search engines can index your website once you hit publish. 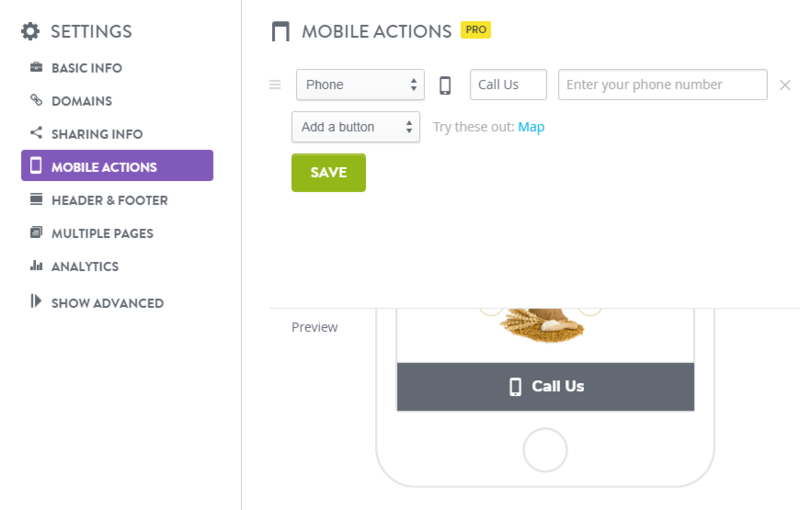 3) Apart from the fact that all the templates are mobile responsive, there’s an additional feature to add call-to-action buttons that are specifically for mobile engagement. You can opt for people to visit your blog/shop, call your business or contact via email while they are visiting the site. The Strikingly logo will appear in the footer by default, but this can be removed in the display setting, so that’s not a big problem. 5) What I like about the platform is that it not only allows you to track visitor traffic with Google Analytics, but also integrates with Google Search Console to check on indexing status and optimized visibility through keywords. Many business website owners don’t use this enough so I am glad to see it there. It also allows Facebook Pixel tracking if you consider running Facebook Ads as part of your online marketing. 6) As far as blogging for SEO is concerned, each blog post is equipped with its own page title, meta description and in-house commenting system. A basic subscription feature is also included at the end of each post to help collect emails from your readers. This service is provided by Strikingly, I tested it and it has a pretty fast delivery rate. 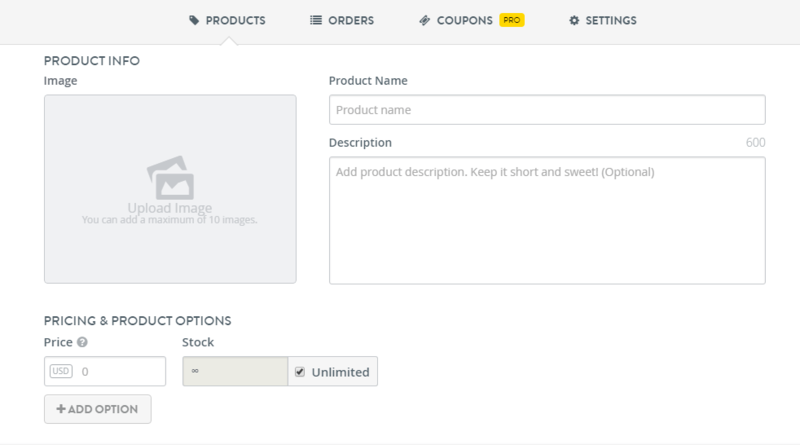 7) For eCommerce, the product listing has more depth than other website builders that I’ve seen. You may include description, pricing options, inventory and category which are all vital information for the online shoppers. The allowance for Limited plan is 5 products per site and 300 products for the Pro plan. 8) Lastly, if you are a total newbie to website creation, Strikingly has got a very thorough knowledge base, with video tutorials, to walk you through some of the important topics that you need to know. While Strikingly tries to improve on their platform usability, some things have remained much the same since 2016. 1) Their in-house domain still costs more than most providers. Even though it comes free with the yearly plans, you are looking at a renewal fee of $24.95 per year thereafter. 2) Despite the flexibility of customizing the templates, there are only about 29 core selection to choose from. That’s a very limited number when you consider the diversity of online niches that are currently out there. 3) Even though all the paid plans come with an in-house analytic program, I found it to be very basic as it only shows the number of unique visitors. This parameter wouldn’t tell you much about a website traffic so if you are looking for more data segmentation, you are better off learning how to use Google Analytics. 4) The outcome of using Strikingly is that it has the tendency to produce a very long homepage if you aren’t aware of it. The core sections (blog, store, contact form and etc.) appear to stack onto each other and the page view gets longer as more section is added, unless you put them under submenus. This might work for some people, but I personally don’t fancy this type of design as I find them to be very bulky and cumbersome to build. 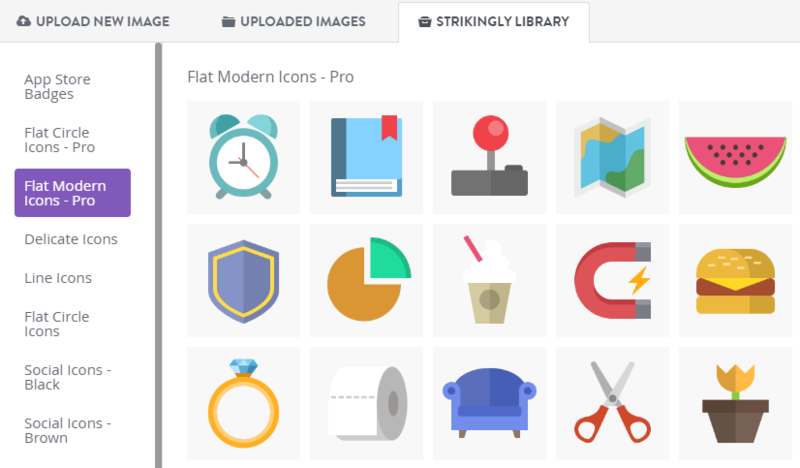 5) While the platform includes an image library, in reality they are just providing icons rather than actual images that can be used alongside a content. So there’s really nothing much to shout about in regards to this feature. 6) Strikingly has undoubtedly made more effort in terms of SEO, but a few things are still missing. There’s no way you can do a 301 redirect if there’s a change in pages/posts and for eCommerce, the lack of SEO settings for product category and specific product images are a few major drawbacks. 7) It’s nice to see that they provide an internal forum to assist users, but as I scroll along the discussion, I noticed that a lot of technical issues are not being addressed by the team and most subject matters are left hanging just like that. In a way, that makes me doubt the efficacy of the platform when it comes to online visibility and user-friendliness for the customers. Out of the box, the builder is pretty easy to use and it’s an affordable solution for anyone who’s looking to build a simple online presence with their business, retail store, portfolio or personal events. Keep in mind though that the templates will be limited and your own initiative is still important to drive traffic to the website. For bloggers, I would avoid using website builders of any kind because they usually don’t emphasize on content structure, which is the most crucial aspect to the success of internet marketing. As of today, I’ve yet to come across a full-fledge Strikingly website that ranks on the search engines. Every time I search for something online, it either takes me to a WordPress blog or a Shopify store. So my guess is that those are still the two main platforms to go to for building an online business. Speaking of WordPress, there’s a place where you can learn all about it, from setting up to getting traffic. If you like to know more, do check out the Wealthy Affiliate platform and see how you can get started for free. I hope that this Strikingly website review has given you a better understanding of what’s like to use a website building platform. Any questions or thoughts about the topic, please leave them in the comment space below and I’ll get back to you. That’s a good tip that Shopify stores get ranked by the search engines. I want to add some eCommerce to my Christianity blog to sell Disciples Cross necklaces that I’m going to have my Mom do the assembly for – and pay her well. As for Strikingly it doesn’t really strike me as being very worthwhile as compared to WordPress for building a content rich blog. As someone who has been looking at and designing websites for a few years, Strikingly seems appealing to users who don’t have too much experience. I love that Strikingly has “special section for header and footer columns” – as I love the eCommerce capabilities that this provides. The subscription costs are pretty reasonable as well, so that too is a plus. Weighing the cons versus the pros, I do have to say I would sway more towards using WordPress as I think there’s more room for expansion. the site you mentioned at the bottom of your post (Wealthy Affiliate). I had used Strikingly before then, but since joining Wealthy Affiliate I have learned farm more than I ever could have elsewhere, and for a cheap cost. Great review and insight! Great review. Strikingly seems like a really good option for beginners, but I think it’s also worth learning how to use WordPress in case you are thinking about future expansion. What are the costs involved in running a WordPress site by the way? Thanks. You can start a WordPress site for as low as $3 to $50 per month. I would recommend going for a package that’s slightly on the higher range because it usually comes with more secure hosting services, faster loading time and better technical support. I’ve been hearing a lot about Strikingly for a while now and I can’t lie, their visuals are pretty cool and sounds pretty straightforward to use. I don’t mind the Google Analytics part as I can do that separately, but Strikingly’s support section is their downside that ticks me off. I’ve been into many programs which directs me back to the support forum but as soon as I ask questions, I got left hanging so it’s definitely something to think about. Glad to find out about them from your review, it’s always so analytical, love it! Thanks for posting a detailed review. I was looking for a new site builder recently as I’ve been hosting my domains at HostMetro for some time now and my last site was created with iWeb (discontinued long ago) and in desperate need of a redesign. After reading your review, I don’t think this builder would have fit my needs. The limited template options and questionable image gallery are deal breakers for me. I’m glad you mentioned about Wealthy Affiliate as I recently signed up for an account with them. Although they are mostly known for their business training, using them as a web host is a deal for the price. I was able to build a full site in a matter of days. Excellent WordPress hosting and a truly helpful community to boot. Your review helped to reassure me that I made the right decision. Great to have you on board with us Scott. I hope you are enjoying and benefiting every bit of the training at Wealthy Affiliate. In my 4 years of hosting with them, I have not had any major glitches to my site so far. Even with every WordPress update, I am still maintaining an impressive speed score from Google so that’s something that I am really happy about. Not having a proper customer service is a deal-breaker for me and though many features within Strikingly seem good, the lack of that area of support will make me think twice about using this builder. Plus, the renewal rates are also high – I will give this a pass and look elsewhere. Thanks for the insights. Hi there, I do like some of the features with this web builder, but when it comes to functionality, I much prefer to use WordPress.